The Pirates lost another home opener yesterday, as Ian Snell's solid performance was wasted by the team's lackluster offensive performance. I was upset while watching the game, but softened a bit when I heard some insider news from a friend of mine. Apparently, some of the Pirates' luggage was lost while returning from Cincinnati on Sunday. The only equipment missing was the bat bag, although there was a bit of a scare when Adam LaRoche's confidence was briefly misplaced in the bullpen. Because of this, the team was forced to use only their fists to swing against Braden Looper. The end result: only 3 hits and 6 players were lost with broken hands. Seriously though, that's three straight depressing home openers I have attended. Snell continued his excellent start to the season, and each day I am becoming more and more convinced that he and Duke are the real deal. He allowed only 1 run in 7 innings and deserved a victory. We are seeing a much more mature Ian Snell than we have in the past, and he seems to have a perfect balance of relaxation and that "Snell doesn't do that" attitude. I like what I am seeing from him. 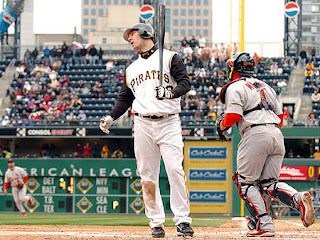 The Pirates' offense was completely shut down, as Looper played the role of Chris Carpenter for the day. The pre-game festivities were enjoyable, with awards given to Lanny and Freddy and some well-deserved recognition for members of our armed forces. There was even a flyover. (I had never witnessed a flyover before, so maybe I'm wrong. But aren't they usually faster and more exciting? Were those just commercial flights heading to Ohio? Oh well.) However, that was about where the fun ended. The most noise from the crowd for the rest of the game came when the sun peeked out and briefly warmed the crowd in the 7th, and after Nate McLouth registered a pinch-hit infield single in the 8th. Just your typical home opener. John Wasdin replaced Snell in the 8th and promptly was charged with 2 runs in ⅔ innings. Why is Wasdin pitching in a 1-0 game in the 8th? I have nothing else to say about that. One more thing: If I have to hear a bunch of idiot fans cheering for the scoreboard to show a virtual fireplace, or a fish tank, or that damn squirrel on water skis one more time, I'm going to lose my mind and start giving myself paper cuts on my eyelids. I am embarrassed to be from Pittsburgh during those moments. I officially hate the Highmark jukebox as much as the Pierogi Race. Yes, it's that bad.